Everytime I get a dinner invitation to Chef Choi’s my palms get sweaty. It’s almost like the anticipation of spring, a first kiss, a lover’s rendezvous. Exciting, elicit, gone almost as quickly as it starts and always leaves you hankering for more. Even before you have time to ponder just how much more succulent Japanese beef can get, they bring out the Matsusaka. 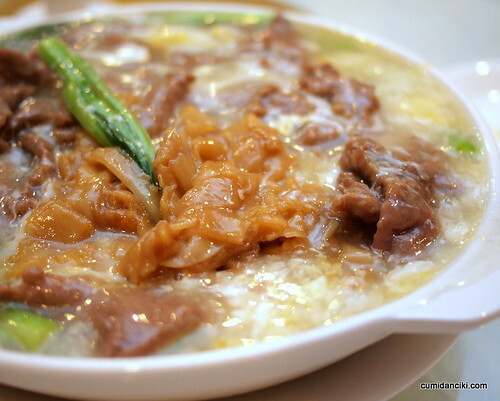 Connoisseurs of super-fatty meat will taste this cut and swooned at the exotic delicacy. Matsusaka comes from the Mie prefecture south of Tokyo. 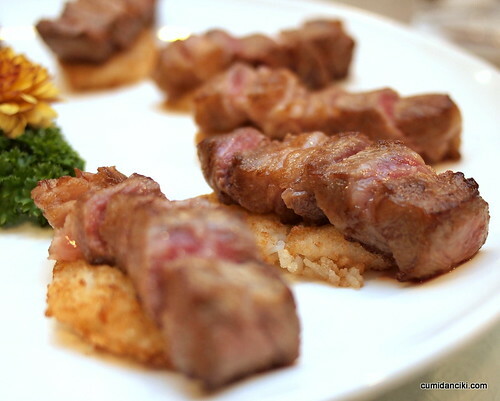 Only female wagyu are raised in Matsusaka, where they are fed plenty of fodder, as well as tofu lees and ground wheat. When they have no appetite, they are fed beer to stimulate their eating, and they also receive regular massages with straw brushes after being sprayed with shochu and are taken for daily afternoon walks. They are more pampered than the average human! Soothing music is played to the cattle to “calm” them and promote better quality beef. Matsusaka ranks way up there with Kobe, Omi and Yonezawa beef. From the incredibly succulent marbled texture, you can hardly spot the difference between Matsusaka and Kobe. Chef Choi… you really know how to push my buttons. Really. The crustacean, which was plucked from its watery bed must have been a hefty bloke. I mean, just look at the size of its claw. I’m guessing 15lb? Anyway, served with the Chinese yee-meen (egg noodles) this was one of the best noodles I have eaten to date. If dinner had stopped right here, I would have been a contented girl but no, more delicious things were in store for our lot. When Cheng Sim throws a party, she really throws a party. I mean, if you ever hear her voice on the other side of the line, inviting you to a noodle party, do yourself a favour and go. Chef Choi.. where was I before you found me? It’s always empowering to stare down your dinner before eating it. 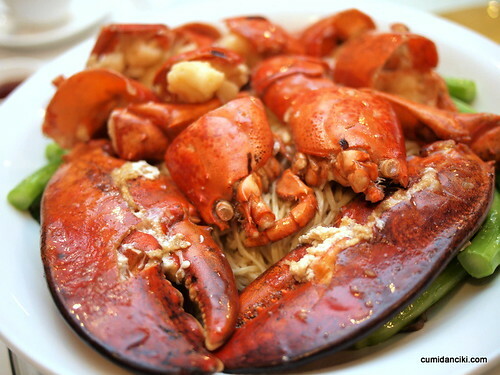 And prepare to get messy with the shell-on massive glistening orange lobsters – they’re worth it, because they’re taut, juicy, and succulent.. dripping with intrinsic flavour. But then we realise, only now has the feast truly begun. Bowl after bowl of different Chinese style cooked noodles are served up so quickly and efficiently we lose track of how many. 8 courses of noodles, I think, to be precise? Almost in atonement, the toppings are conspicuously fresh and nourishing—the chopped scallions and slivered spring onions, and the still crunchy greens propped on the rim. In Marcel Proust’s ”Remembrance of Things Past,” a stream of memories is triggered by the taste of a madeleine cookie, the kind the narrator used to eat in his childhood. 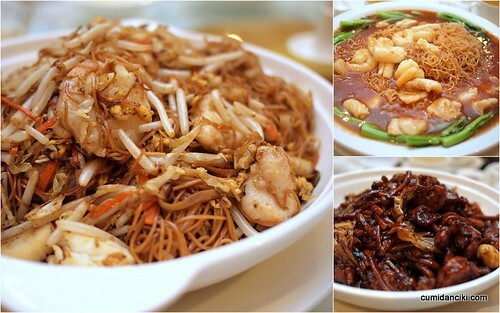 For me, it’s Chinese style fried noodles. I was sitting over a bowl of simple homecooked fried noodles in my grandma’s kitchen. Remember what I am talking about ? The mushy vegetable concoction with your choice of meat served on hard egg noodles? That was my epiphany. Sitting over the gooey, stewy noodles, the steam from the dish blurs my vision, like a memory soap scene on TV. 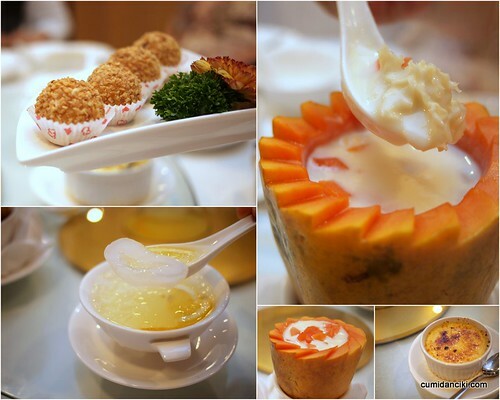 Then a flood of childhood remembrances of Chinese meals past began to spill forth. With each forkful they grew sharper. Grandma toiling over the stove, relatives cackling and teasing me, calling me names, the clanging of bowls and chopsticks as friends dig into the last strand of fried noodles, prepared with love by my grandma. Ah, this steaming bowl of old-style chinese fare evokes other exciting memories where my grandpa would slip out of a cold drizzle and into a mysterious coffeeshop with me, his granddaughter in tow. After ordering hastily from an obsequious waiter, we would shovel down the food and plot how to get grandma to bake us a butter cake or get out of doing household chores to play in the rain. On a separate occasion me and dad would steal out to Campbell Road (Jalan Dang Wangi) to eat our fill of tomato noodles because my mother’s cooking was inedible one night and we could hardly bring ourselves to eat her disastrous cooking. The Chef Choi version of this Campbell road Ketchup Chow Mei Fun strikes a chord and is just spot on. And that is why this sudden burst of nostalgia over a greasy serving dish of goopy noodles.. why the regret over this dish, once the quintessential Chinese food of my childhood days in Ipoh, Perak and my teenage years in Kuala Lumpur. 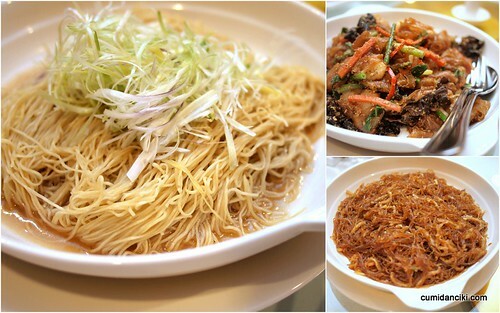 Nothing comes close or will ever replace the memories of simple chinese noodles cooked with love. Winding up with desserts, I am really happy I came to Chef Choi’s. The company, the food, and the memories of a time past, are priceless. Who would have thought that an unpretentious noodle party, prepared with love would be this perfect. Then again, most of the best things in life are. Check out the previous write ups on Chef Choi here and here. Previous articleTaste, Feel and See Norway! Next articleMy friend, Delectable Su. Any estimation on the per-pax pricing? About RM145 per head , and that’s because the Matsusaka beef and lobster noodle took up approx. rm95 per head! 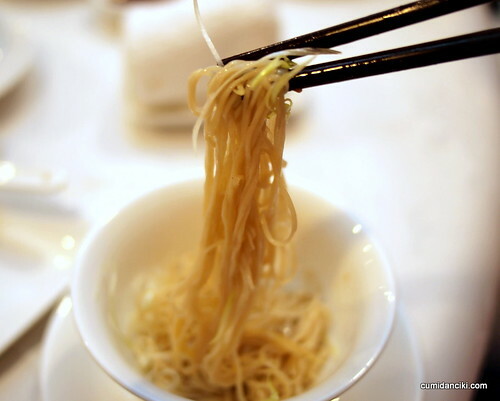 I miss those gorgeous noodles! 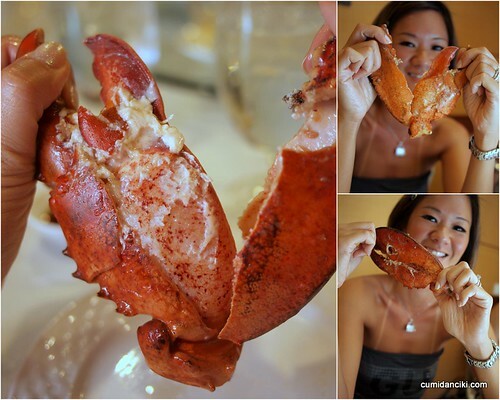 And the lobster of coz – oh my! 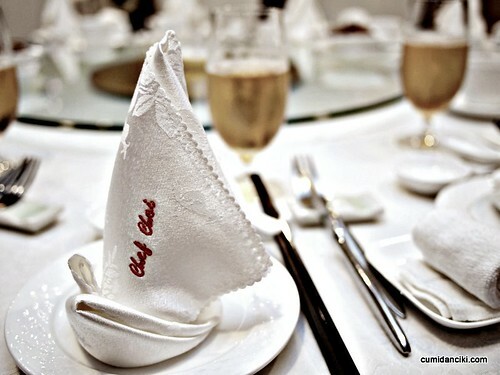 I has been a while since the last time I really indulge in fine Chinese meal!!! My.. look at the lobster! my my.. what LARGE claws you have.. MWUAHAHAHA! Oh my… Yum Yum! Another great picture of you and food! You look so good even if you are with food. 🙂 I just had lunch but you make me hungry again girl. Ooooh, nooodles, luv it…but missy, it begs the question, howEVAH did missy no carbs pull this one off? did you eat one strand from each dish??? a claw with a strand of yellow mee….??? And what is ketchup fried bihun?? tomato bihun la kat.. what la u haha! i know.. Cheng Sim is the most generous person on earth!! it was, Kiran. had to wipe the drool off my face at every turn. Hi MY! It was nearly as big as my face!! yes, but have yet to blog it! Ooo wow, I was going to try to go to bed, now I think I need to find some late midnight food!!! That crab looks unbelievable! “It’s almost like the anticipation of spring, a first kiss, a lover’s rendezvous.” Whoa. I want to eat food that makes me feel this way!